A brand new style of a club named “Club Disco Shangri La” will be opening in Kin Town, and it’s a club like you have never seen before. Shangri La features a spacious dance floor, spectacular lights, various types of music playing throughout the club, and amazing guests like YOU! 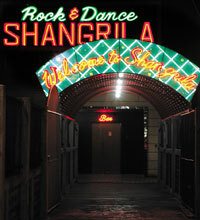 Shangri La guarantees to entertain you for four nights, and heat up the whole Kin Town. Visitors to Shangri La during Valentine week, will receive a free membership card for Shangri La and an immediate free drink. Drinks usually costs ¥2,000, and the member card is valid until June 31st. Members can get free or discounted drinks, so get a membership card get a good deal! A lack of a ride or transportation to commute, doesn’t rule out a Shangri La visit. Shangri La offers a big bus tour that takes you to Kin Town. They offer a free drink for the trip, and bilingual guides will be on the bus to take you there. Everybody can sit down and relax, or travelers can move in time with the music videos that plays on the bus. The bus will run every hour, and leaves from every base on Okinawa. The bus will board and depart from Gate 2 Street in Okinawa City. Also, check the price for the group discount. The Valentine bash at Club Disco Shangri La starts from February 14th – 18th, and the club opens at 7 P.M. Shangri La is located outside of Camp Hansen Gate 1. To find out more information about the event, please visit the website at: http://www.myspace.com/shangriladisco. For your reservation on the bus tour or for inquiries, please contact at 090-1947-1624 or e-mail: Whoisthebirdman2005@yahoo.com.